The Redskins announced that they’ve signed third-round cornerback Fabian Moreau, meaning the club has now locked up its entire 2017 draft class. 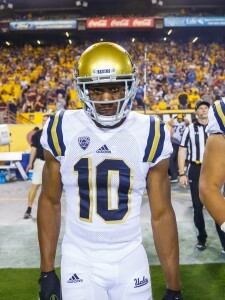 Moreau, a UCLA product was considered a late first-round or early second-round prospect before tearing his pectoral during the predraft process. Following the injury, Moreau fell to the 81st overall pick, but should still have a chance to compete for playing time during his rookie campaign pending the speed of his recovery. Washington’s cornerbacks behind Josh Norman currently include Bashaud Breeland, Quinton Dunbar, Kendall Fuller, and Dashaun Phillips. Reports emerged last night that Bears head coach John Fox was unaware of his club’s intention to draft North Carolina quarterback Mitch Trubisky until a “couple hours” before the draft. GM Ryan Pace subsequently denied those reports, saying his head coach is involved in all of the team’s decisions. “That stuff is so false,” Pace said (via Mike Florio of ProFootballTalk.com). “There’s consistency in everything we do, so we all work arm-in-arm and that’s the way it is and that’s the way it should be. The Vikings reportedly approached the 49ers about trading for the 104th pick, according to Matt Maiocco of NBC Sports Bay Area (via Twitter). However, San Francisco wanted to guarantee that they’d get Iowa quarterback C.J. Beathard, so they rebuffed Minnesota’s advances. Ironically, Minnesota was previously in possession of that pick. The Saints were fans of Texas Tech quarterback Patrick Mahomes, general manager Mickey Loomis told Larry Holder of NOLA.com (Twitter link). However, with Ohio State cornerback Marshon Lattimore still being on the board, New Orleans wasn’t too interested in moving up for the signal-caller. Mahomes was ultimately reelected 10th overall by the Chiefs. 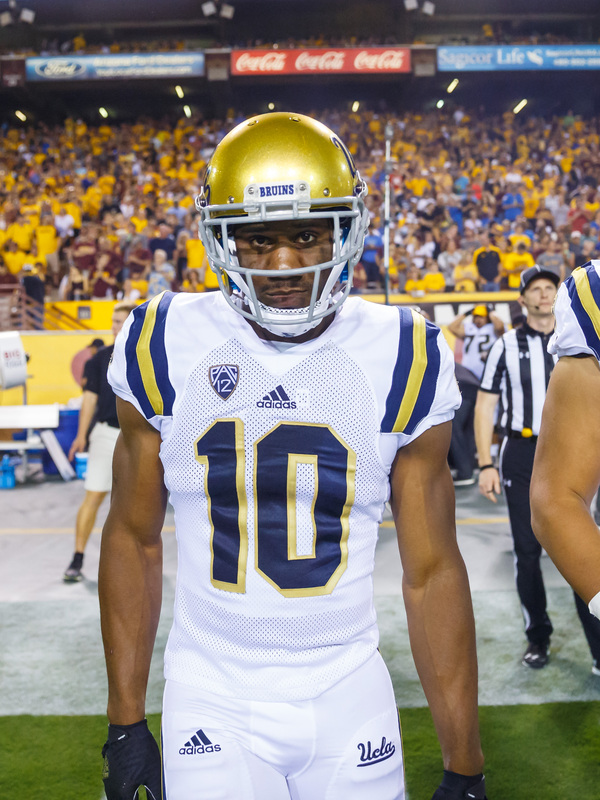 UCLA cornerback Fabian Moreau‘s pectoral muscle is “looking great,” tweets NFL.com’s Ian Rapoport. This reassurance probably convinced the Redskins to take the defensive back with the 81st-overall pick. The Lions selected cornerback Teez Tabor with the 53rd pick, despite the fact he suffered a hamstring injury during his workout with the team. Rapoport tweets that the Florida product didn’t end up working out for any other teams. UCLA cornerback Fabian Moreau, a possible first-round pick, had successful surgery to repair a torn pectoral muscle, according to Ian Rapoport and Mike Garafolo of NFL.com (Twitter links). His recovery timetable will be four-to-six months, but one source tells Garafolo that there is some hope he can be ready in time for training camp. Word of the surgery, of course, will hurt Moreau’s stock. However, if he can really recover within that timetable, he might not fall far. A team willing to be patient might be willing to take the UCLA product somewhere in the second round. Moreau is widely considered to be one of the best cornerbacks in this year’s class, though the overall depth at the position could lead teams in another direction near the top of the draft. The most recent rankings from NFL.com’s Daniel Jeremiah (before word of the surgery broke) had Moreau as the No. 42 prospect overall and the eighth-best cornerback. ESPN.com’s Mel Kiper and Todd McShay did not have him going in the first round of their latest mock drafts. Quarterback Nathan Peterman will conduct a private workout for the Eagles next week, and will also meet with the Steelers in April, tweets Jeremy Fowler of ESPN.com. Earlier this year, one scout told Matt Miller of Bleacher Report Peterman has a chance to be the 2017 version of Dak Prescott, a mid-round talent who emerges into a viable starter. Peterman, who transferred from Tennessee to Pitt before the 2015 season, has averaged 2,571 yards and 23 touchdowns over the past two years. UConn safety Obi Melifonwu has meetings lined up with the Steelers, Seahawks, and Saints, tweets Aaron Wilson of the Houston Chronicle. Meanwhile, Melifonwu met “extensively” with the Lions yesterday, and will also visit with the Panthers, according to Tony Pauline of DraftAnalyst.com, who reports roughly 40% of NFL clubs view Melifonwu as a cornerback. Melifonwu, a four-year starter for the Huskies, posted four interceptions during the 2016 campaign. The Giants will meet with Utah offensive tackle Garett Bolles in April, according to Dan Duggan of NJ.com (Twitter link). New York isn’t sold on keeping 2015 first-round pick Ereck Flowers at left tackle, and Bolles could give the club another option along its front five. Bolles is expected to be selected on Day 1 of the draft, and has a chance to be the first offensive lineman off the board. Prior to possibly injuring his pectoral while bench pressing on Tuesday, UCLA cornerback Fabian Moreau spent time with the Lions, Dolphins, Saints, and Bengals, reports Pauline. Additionally, Moreau met with Cowboys defensive backs Joe Baker, per Pauline. Rob Rang of CBSSports.com projected Moreau as a back-end first round pick (and the third-best cornerback on the board) before news of his injury broke. Moreau’s UCLA teammate, edge rusher Takkarist McKinley, will visit with the Browns in early April, per Courtney Fallon of NFL.com (Twitter link). After that, McKinley plans to meet with the Ravens, Steelers, Cowboys, and Lions, per Fallon. McKinley put up 10 sacks in 11 games for the Bruins in 2016. Washington cornerback Sidney Jones underwent surgery today to repair his torn Achilles, according to Adam Schefter of ESPN.com (Twitter link). Jones, who suffered the devastating injury at his Pro Day earlier this month, is expected to resume running in four months. Projected to be selected in the first round before the Achilles tear, Jones himself tweeted today that he’ll be able to play during the 2017 season, though that could certainly be optimistic. Jones isn’t the only cornerback prospect to be hit by injury, as UCLA defensive back Fabian Moreau is believed to have suffered a pectoral injury while performing a bench press today, tweets Courtney Fallon of NFL.com, who cautions that the “full extent” of the injury is unclear at present. Rob Rang of CBSSports.com projected Moreau as a back-end first round pick (and the third-best cornerback on the board) before news of his injury broke. UNC quarterback Mitch Trubisky will work out for the Browns, Jets, 49ers, and Chiefs, among others, per Andrew Carter of the Charlotte Observer (Twitter link). Trubisky, considered one of the top-three signal-callers in this year’s class, is a surefire first-round pick and may be selected within the top five. Cleveland, for one, was said to be “strongly considering” Trubisky with the first overall pick, although that talk has died down recently. Controversial running back Joe Mixon met with the Raiders on Monday, reports Adam Caplan of ESPN.com (Twitter link). Because Mixon is from the Bay Area, his visit with Oakland won’t count against the Raiders’ allotment of 30 predraft meetings. Although video has surfaced of Mixon physically assaulting a female, he’s still expected to be drafted next month and a number of clubs have preceded the Raiders in meeting with the Oklahoma back.